Dr. Wong, the famous co-founder of Hasson & Wong hair clinic, will be coming to London and providing free no obligation consultations on Sunday August 3rd and Monday August 4th. This is an excellent opportunity for anyone considering hair restoration now or in the future to meet with a world class hair transplant surgeon and find out what treatment options are available nowadays, whether you are a good candidate for the procedure, details about the actual process and what to expect. The consultations will take place in Central London at the Thistle Hotel in Marble Arch. The demand last time was very high and and consultations are strictly by appointment only. This is a rare opportunity so please register in advance to reserve your slot. First come first serve. Past and current patients of Dr Wong are welcome to attend. Their UK representative David (aka garageland) will be available to meet at that time. 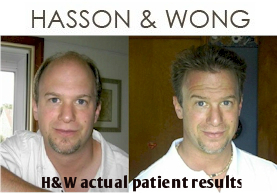 David is a veteran hair transplant patient on the internet and has had 5 procedures spanning over 17 years. To register, email ukconsultant@hassonandwong.com or call 0757 8164162. For those who are unable to attend the free consultation in person,telephone, email or virtual consultations are available at any time. Thanks very much for posting this. Due to the high demand to see Dr Wong in London we have added a third day of consults which will be Tuesday August 5th. This extra day will no doubt be filled fast as demand is very high and and appointments are strictly by appointment. Past and current patients of Dr Wong are welcome to attend. on ukconsultant@hassonandwong.com or call 0757 8164162 for more information.